5. Pour mixture in ( 4 ) over fish. Serve garnished with coriander. fish, finely minced (Pla Krai) 1 kg. string beans, finely chopped 2 ½ c.
kaffir lime rind, grated 1 ½ tsp. 1. Pound dried chillies, lemon grass, galangal, krachai, coriander root and kaffir lime rind together until smooth. Add shallots and pound until smooth again. 2. Knead minced fish by tossing against inside of mixing bowl to make firm paste, adding salt water while kneading. Fold in the mixture in 1. to the paste. Knead in salt, egg and kaffir lime leaves. 3. Heat oil over low heat until hot. Form fish mixture into firm balls and flatten a little. Deep fry until cooked. Drain and remove to serving plate. 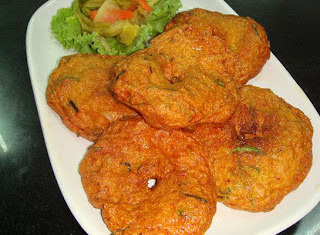 Served accompanied with fresh vegetables and dipping sauce. Note : Add ground roasted peanuts into dipping sauce before serving. finely minced pork 1/4 c.
finely minced shrimp 1/4 c.
glass noodles, soaked in water and cut into 1-inch pieces 1/4 c.
ear mushrooms, finely sliced 1/4 c.
coriander root, garlic and pepper 1 tbsn. 1. In a mixing bowl, dissolve wheat flour with water until condensed. 2. In a wok, pour cooking oil over a low heat. Add coriander root, garlic, and pepper. 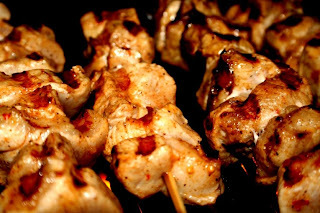 Fry until delicious aroma over a medium heat to low. 3. Add pork and shrimp and continue frying until well mixed and dried. Lift from a wok. Place wonton pastry sheet, put filling in the middle, and roll forward. 4. Wrap both ends and continue rolling. Close both ends with wheat flour. In a wok, pour vegetable oil over a medium heat. 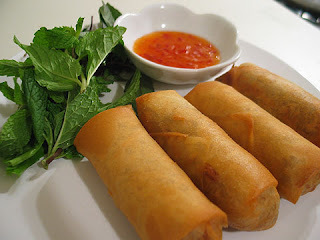 When heat, deep-fry spring roll until golden and crispy. Lift from the wok and let it drain then serve. 1.Stir fry garlic in the oil over medium heat. Add the shrimps and toss until they are coated with garlic. 2.Season with thin soy sauce, ground pepper, oyster sauce and sugar. 3.Add the scallion and mix well. 4.Serve on the plate with steamed vegetables. 2. Add roasted chili paste, soy sauce, green onion, chilies, sugar and stir fry for another 2 minute and until all ingredients mixed well. 3. Transfer to a serving dish. 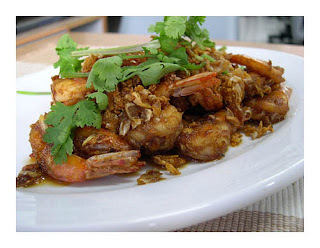 Garnish with coriander leaves on top and serve immediately with steamed rice. 1. Marinade all ingredients together about 2-6 hours before grilling (depending on how much time you have, longer marinade time will make the pork more aromatic and delicious). 2. When the pork is ready, thread a skewer through the pork. Grill the pork until it is well done. While barbequing, brush pork with marinade. 3. When done, serve with fresh vegetables and slices of cucumber and tomato. Mix all below ingredients in a small pot and heat it until boiling. Remove and set aside. 1. Wash green mussels with clean water. Then scald it in boiling water. Remove and drain. Then remove shell, and set aside. 2. 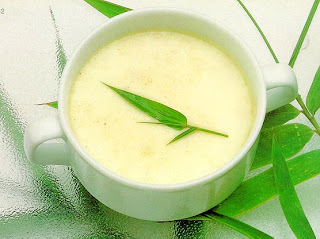 In a medium-sized bowl, add tapioca flour, rice flour, limewater and water together. Stir until mixed well. 3. Heat oil in a fry pan until hot. Pour in the flour mixture in the pan and add the green mussels over the mixture. Do not stir or try to flip it until nearly cooked. 4. Pour beaten egg over the mixture. Fry until the mixture is golden brown. Then turn it over to another side and fry until cooked. Remove from heat and transfer to a serving plate. 5. Heat oil in a fry pan until hot. Add garlic and stir until fragrant. Then add bean sprouts, scallion, soy sauce and sugar. Stir until cooked well then transfer to a serving plate (besides fried mussels). 6. Sprinkle with pepper powder and coriander leaves. Serve immediately with dipping sauce. 1. Score the fish at an angle all the way to the bones on both sides to help it cook faster. 2. Heat oil in a wok, about half a cup or at least to the side of the fish. Fry the fish on low heat, about 10 minutes on the first side. Don't try to loosen the fish from the pan until it is done, otherwise, the fish breaks up. 3. When the first side is cooked, flip and fry the other side, for 5 minutes. 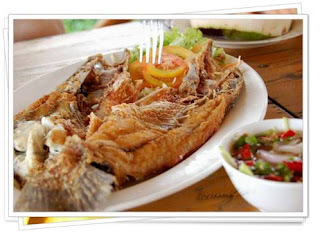 When the fish is cooked thoroughly, remove and set it on a plate. 4. 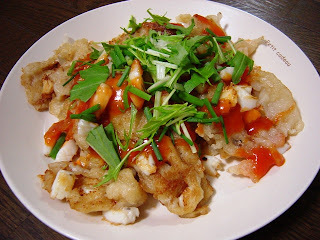 To make the sauce : Heat one tablespoon of the leftover oil (after deep frying fish). Wait until hot then add sugar, fish sauce, and oyster. Stir until mixed well then remove from heat. 5. 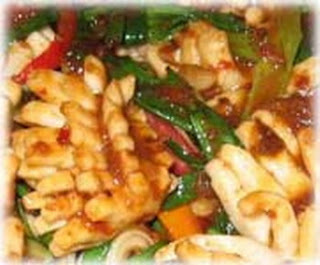 Garnish the fresh vegetables with fried fish. 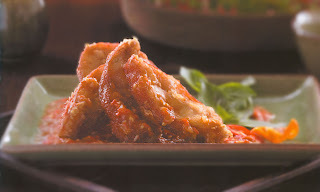 Before serving, pour the sauce on top of fried fish then serve immediately with hot steamed rice. 1. Beat the eggs in the medium-sized bowl. Add the chicken stock (or water), tomato, pepper powder and soy sauce. Stir until all ingredients mixed well. 2. Heat water in a steamer. Wait until boiling, then place the bowl and turn down to medium heat. Steam for 15 minutes or until cooked. 3. Remove from heat. Sprinkle with chopped scallions and coriander leaves (and fried garlic : optional). Serve immediately with hot steamed rice.